I wrote previously about how much I was using and enjoying my 9-inch Barnes and Noble Nook HD+. I’m still using and enjoying it, but a few of the things I mentioned in that article—the useless home screen, the schizophrenic updates from two app stores at once, and so on—started to annoy me. I started to fantasize about installing a clean, uncluttered Android operating system on it instead of using the Nook operating system. The best-known general-purpose Android OS is CyanogenMod, and that’s what I was thinking about. Last time I did this, I didn’t like the result. I’ll explain why, then move on to show you how to install CyanogenMod easily on the Nook HD+ and talk about the results. (I’m very happy thus far). I never wrote about this, but when I previously had a 7-inch Nook Color, and installed CyanogenMod on it, I was happy at first but after a while it wasn’t what I wanted anymore. I had a number of issues with things like Netflix not working, exiting with an error about being unsupported on this device (though clearly it wasn’t the device, since the stock Nook OS had Netflix), various apps not working well, and so on. The base OS seemed to work well enough, but after trying to install some more apps, I found some problems. Combine that with the not-large-enough size and the short battery life, and I just eventually sold it on eBay. I tried wiping it and reinstalling stock Nook OS, but for some reason I must have not backed up the stock ROM correctly, and it didn’t really function right. So I was very hesitant to go through the same experience again with my new Nook. I like the hardware and user experience of the new one. It’s light, it’s a good size, it has great battery life, and it’s powerful enough (mostly). What if I ended up with a glitchy OS again, or problems with apps? To mitigate this risk, first I tried a couple of alternatives. One was to install a custom home screen via the Nova Launcher app, instead of the Nook home screen. This let me get rid of the large, ugly area where Nook wanted to show me things I didn’t want to buy. Combined with a nice sharp Zen-rocks-and-a-flower wallpaper, it felt like a much nicer user experience. The lock screen was still ugly, though. I tried disabling that and replacing it with another one from the app store, but that never worked very well; I was unable to really disable the Nook’s lock screen, and the new lock screen didn’t work right. The default Nook lock screen is really pretty embarrassing. There’s a high-resolution screen on the device and the lock screen looks like it was made for a low-res device. I’m nitpicking, but my point is you can skin some of the Nook, but not all of it, so the user interface still feels cheap. There were other minor problems—clearly the Nook OS is based on an old version of Android. Fast task switching (and task killing) aren’t possible. There’s also lots of little annoyances like having apps pop up messages “Syncing Your Library” while watching a movie. Two major problems remained. One was the bloatware installed on the Nook, including the Nook app store that irritatingly kept overwriting versions of apps installed from the Google Play store. More serious, though, was the app instability. Gmail was unusable for a couple of weeks while some bug worked its way through the release process. Gmail is a big part of why I have the tablet to begin with. And even after it became usable again, it would crash at random times. I’d be watching a movie and see a pop-up, “Unfortunately, Gmail has stopped.” I’d open the Chrome browser and it would lock up the tablet for 30 seconds and then kill itself. I am not sure if I’m right, but I blame this on the Nook app store and/or the ancient Nook OS, not on Gmail. Another problem was performance. I installed Monument Valley and I love, love, love it. It’s just amazing. But the Nook didn’t seem quite fast enough. Graphics stuttered, and there were visual glitches and other artifacts. There were some other things—inability to encrypt the whole device, for example. So although the skinned device was a lot nicer, it was still starting to wear on me. And I read online that CyanogenMod solved these problems: clean, uncluttered; latest version of Android; lots of performance improvements; safety and privacy improvements over and above even Google’s open-source Android releases; ability to encrypt the whole device. So I decided to go for it and install CyanogenMod! But not on my device. I didn’t want to take the chance of wiping it and ending up wishing I hadn’t. When I bought my first Nook HD+ 9-inch tablet, they were selling for $175 or so, and $100 or so refurbished on eBay. Now they’re discontinued, and eBay is the best place to buy one. I got a practically brand-new one for $109 including shipping. This device would be my sandbox. And if I liked it, well, I have a gift idea for what to do with the extra one. Installing CyanogenMod is really quite easy. The online forums are super-confusing, though. That’s the hard part. All the instructions seem to cater to someone who already knows what they’re doing, or they’re written in a spastic style that is impossible to understand. In many cases they just plain don’t work; they are written by people who are speculating/extrapolating and haven’t done it themselves. So I’m going to walk you through it plain and simple. I’ll follow the instructions on the CyanogenMod Wiki for the Nook HD+ and the corresponding installation instructions with some clarifications and extra details. A lot is missing or assumed there. You need to download some things before you start. Don’t unzip these files, just download them. Don’t put them onto the SD card. Just keep them on your computer. This is CyanogenMod version 11. ClockworkMod: any version that is built for the Nook HD+. This is the sketchiest part of the process, because you typically have to hunt around for something built by someone and just linked into a forum thread. You don’t need the latest and greatest, you just need something that’ll boot up from a micro SD card. I downloaded NookHDplus-CWM-6046-for-internal-memory-rev0-(07-13-14).zip from this XDA thread and found it to work fine. Download this to your computer as well. For some reason, the online instructions all do this simple task in bizarre ways. I think a part of that may be due to people using Windows, which doesn’t have the dd command. If you use Windows, you may need to download a bunch of stuff as instructed on the XDA thread I just linked to. But if you use a Unix-based OS, you can just put your SD card into your computer and copy the recovery image onto it with dd. You’ll need to make sure the SD card device is unmounted, and figure out what the device’s Unix path is. I assume you can do that without my help. On my Mac, the device was /dev/disk2. Then, unzip the ClockworkMod file, and dd the recovery.img onto the device, e.g. A moment later you should see a menu with options to do some basic operations—reboot, install, backup, and so on. If this doesn’t work, you’ll need to re-read, perhaps read online info… keep working until you get it. It worked the first time for me. Use the volume keys to highlight the desired menu item, the Nook’s home button (the N button) to select/OK the highlighted item, and the power button to go back. Note that, instead of following the confused and contradictory instructions online about copying various files to this bootable SD card, and whether that will or won’t work and in what order you have to do it, we are only putting the recovery.img file onto it. Once you have the Nook booted into recovery mode on the SD card, you need to make a backup. Use the volume keys to go to “backup and restore” and choose “backup to /sdcard” and let this run. It may take a while. This will be your backup in case you want to restore the stock Nook OS and all your data. While this is working, move on to the next step. The Android debug bridge (adb) software lets you connect your computer to the Nook when it’s booted into recovery mode. We’ll use it to copy the necessary files to the Nook’s internal storage and then to install these. Follow the instructions on the CyanogenMod Wiki to install adb. Please read the instructions carefully. You basically need to download some software, unzip it, execute it, and in the menu that appears, select a fairly minimal set of tools to install. The initial install isn’t the full suite of software, it’s just an installer you use to get the stuff you really need. Presumably your Nook’s backup has finished now. Next, you have to completely reset the Nook. You can’t install CyanogenMod onto a Nook that hasn’t been reset. I don’t quite understand why, but the installation process failed for me (and others online) until a factory reset. Don’t use the factory reset in the Nook itself. Use the reset function built into your bootable ClockworkMod disk. Select wipe data/factory reset and let it run. It should only take a moment. You have to mount the Nook’s internal storage (often referred to as “sdcard” although it is not really a card) so you can copy the files you’re going to install. Navigate back to the main menu and select mounts and storage, then mount /data. For some reason ClockworkMod refers to it under different names, but this is the correct thing to mount on the Nook HD+. There are a couple ways to install software onto the Nook. I tried the “sideload” method mentioned in the CyanogenMod wiki’s instructions, but it didn’t work. The “push and install” method worked, so that’s what I’ll document here. Remove the USB cable from the Nook power charger and plug it into your computer. Your computer is now connected via USB to the Nook. These take a few moments to transfer. When I did it, they took about 55 and 40 seconds, respectively. Now you’re ready to take the plunge! On the Nook, use the power button to return to the main menu, and select install zip, then install zip from /sdcard. Select the CyanogenMod zip file and install it, then the Google Apps (gapps) zip file and install that. If you don’t see the files: reboot the Nook and try the transfer again. I have gone through this process a couple of times and had the transfer appear to succeed (but the files never appeared in the ClockworkMod menu), then when I rebooted the Nook and tried again, it worked fine. I believe it was a problem mounting the /sdcard directory. After installing: Reboot. You’re done. First boot will take a minute or two; you’ll be presented with a setup menu after that. Subsequent boots will take about 20 seconds in my experience. The process of installing CyanogenMod onto an Android device is a bit like buying a computer with Windows and replacing it with Linux. It is faster and graphics are noticeably better. No glitches or visual artifacts in Monument Valley, for example. All the Nook-specific annoyances are gone, naturally. Hulu’s app wouldn’t install, saying “Your device isn’t compatible with this version.” Too bad; with the stock Nook OS, it installed OK. Not that I ever used it, but it installed. No problems with Netflix, Spotify, Pandora, and lots and lots of other apps. I discovered things I didn’t even know about my Nook’s hardware. For example, I thought it didn’t have a microphone. With the newer version of Android that’s installed now, the Google Now “OK Google…” instructions work fine. It hears and recognizes my voice! Mind blown! Having a clean, uncluttered tablet OS is so nice! Full-device encryption doesn’t do anything. It shows an Android logo, but no progress bar or other feedback. I didn’t realize it was stuck until I got suspicious after 10 hours or so, checked online, and found that this is apparently a known problem. Alas, I still cannot take this device out of my house or put any sensitive data on it, because it is not secure enough for me. In other words, I’m loving it as a tablet to use around the home. 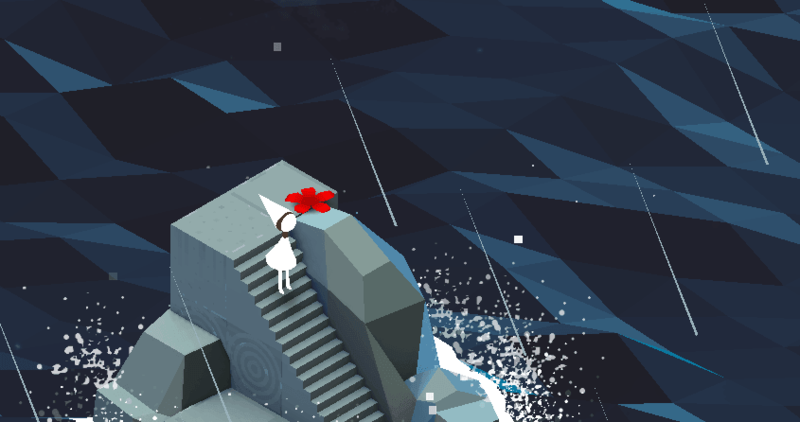 I leave you with this precious gift from Ida, the protagonist in Monument Valley. You’re welcome.